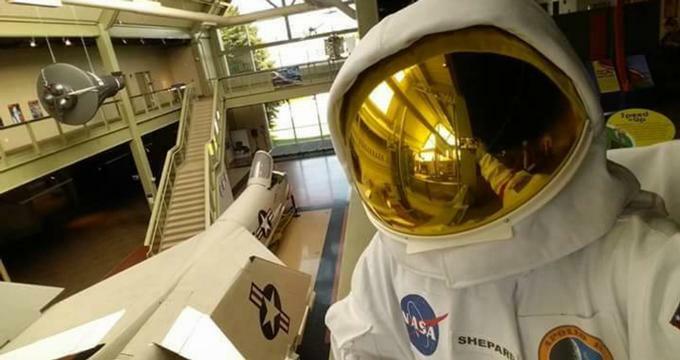 Concord, New Hampshire’s McAuliffe-Shepard Discovery Center is an air and space museum. The discovery center is named in honor of two New Hampshire based astronauts, Christa McAuliffe and Alan Shepard. Exhibits and displays teach about the lives and history of both McAuliffe and Shepard, as well as the workings of science and space. Exhibits are centered on cosmic rays, infrared, minerals, the sun, and the light spectrum. Among items in the permanent collection is the CATSAT. The satellite designed by students and faculty at the University of New Hampshire was engineered to detect gamma rays and determine where they come from. Although the satellite met all of NASA’s requirements, it was unable to launch due to trouble with NASA’s launching vehicle. Living and Working in Space displays items on loan from NASA which demonstrate what life is like aboard a space shuttle. Items include a space treadmill and harness, a space toilet, and an authentic ejector seat. In other exhibits, a fully functional HAM radio allows guest to learn about Morse code and to send a receive signals, as well as contact the International Space Station. A life-sized model of the Mercury capsule is a replica of the capsule which took Alan Shepard into space. A refurbished XF8U-2 Crusader Jet is on display. The prototype has been used extensively for flight testing, and is now retired from its service with the US Marine Corps. A large-scale model of the Space Shuttle, complete with external fuel tank and rocket boosters is also on display. A touch-screen display and actual artifacts astronauts carried with them on board allows guest to learn about life in orbit. A 103-seat planetarium at the Discovery Center offers a full-dome screen using state-of-the-art digital sky technology. A database of over 110,000 stars and planets allows visitors to experience the far reaches of the universe. Planetarium shows last 35-45 minutes and begin multiple times per day. History: Sharon Christa McAuliffe was selected over 11,000 other applicants to become the first teacher in space, and was one of the seven crew aboard the Space Shuttle Challenger when disaster struck in 1986. All seven crew were lost when the Challenger exploded less than 2 minutes after launch. Alan Bartlett Shepard was the first American to travel to space in 1961 aboard the Mercury-Redstone Rocket. In 1971 he set foot on the moon as commander of Apollo XIV. Both McAuliffe and Shepard called New Hampshire home at the time they were selected by NASA for space travel. The Discovery Center began as a state-run planetarium in honor of Christa McAuliffe and opened in 1990. After the death of Alan Shepard in 1998, the state of New Hampshire officially memorialized Shepard at the planetarium in 2001. The science museum was added in 2009, and the site was renamed to reflect the new mission, which incorporates earth and space science learning, as well as astronomy and aviation. In 2013, the Center became an independent, non-profit organization and now self-funds through program admissions and donations. Ongoing Programs and Education: The McAuliffe-Shepard Discovery Center offers an extensive array of educational programming. Super Stellar Fridays occur the first Friday of each month during the school year. The evening program features a presentation followed by a planetarium show. On clear nights, the observatory is open for star-gazing along side members of the New Hampshire Astronomical Society. An after school Science and Engineering Club meets on ten consecutive Wednesdays in the fall and spring. The Club hosts a chapter of the First Lego League, a robot-building program and contest for school-aged children. Educator Resources include extensive homeschool curriculums and on-site programming, Scout badge workshops, and on-site resources that allow teachers to bring programs and activities to their classrooms. Aerospace Fest takes place each May and celebrates the anniversary of Alan Shepard’s first spaceflight. The full-day family event offers flight simulations, chemistry experiments, rocket building, a planetarium show and several other hands-on activities. Past and Future Exhibits: New exhibits in 2018 will include True or False, an exploration of some of the biggest myths about the natural world and how the scientific method is used to discover what’s true about the world around us. The bi-lingual exhibit is in partnership with Heritage Canada and will be in English and French. Math Moves! uses fun activities to build confidence in math skills. The exhibit, in partnership with National Science Foundation will be in both English and Spanish.